Wouldn’t it be great to have a resource where you could figure out exactly what your ex boyfriend meant when he said something to you? Well, now you can with the latest video from Ex Boyfriend Recovery. So I thought a lot about how I was going to structure this video and I decided I was going to divide it up into two difference sections. The first section Im basically going to give you the tools to dissect what your ex boyfriends means when he says something to you. Also Im going to be covering the most asked questions. No not that kind of tool. Basically this is going to be the kind of tool to dissect what your ex boyfriend really means when he says something to you. And I like to call the Action Vs. Words Theory. Have you ever heard the phrase action speaks louder than words? Basically what that means is when someone says something to you, ignore what they say and look at what they do. This is what I want you to do when it comes to what your ex boyfriend is saying. Actions always speak louder than words and that is the premise of the Action Vs. Words Theory. Now let me give you an example. If I were to say “I’m going to read you a children’s book today” or instead I did this. Alright “Today I’m going to read you Sleeping Beauty. Let’s begin” (INSERT PICTURE) I’m so above this. Basically what happened there, I told you I was going to read you a children’s book but when push came to shove when it was time to put up, I shut up. So a lot of the time women who get really upset at what their ex boyfriend says to them, they aren’t looking at the actions. Because after all breakups are really highly emotional and after a breakup we say things that we don’t really mean. Speaking of things we don’t mean, what I’d like to do is turn our attention to some of the most popular things an ex boyfriend can say after a breakup that make women wonder what he really means by that. So I suppose I should start off by saying that what I’ve done is I’ve identified the top three things women on Ex Boyfriend Recovery ask about. Whoa That scared me. And a lot of women have the same reaction when their ex boyfriend says I hate you. Now the first thing I want to tell you is we really are going to rely on the Action Vs. Words Theory. Take everything he said with a grain of salt. If his actions don’t line up with hating you, he most likely doesn’t hate you. But what could be going on in his mind to make him say something like that. Well there are a lot of things that could be going on in his mind but what you really have to understand. Breakups are highly emotional. When emotions run high logic runs low. Well if I said something like that, if you stuck to the core of what I really meant when I said it, its not that I hated the movie with every fiber of my being. Its that I hated the way it made me feel. I think that is applicable to breakups. Again when emotions run high logic runs low. We often say things we don’t mean. When your ex boyfriends says “I hate you” what he really means is “I hate how this entire situation makes me feel.” That’s understandable. But what else could be going on in his mind? Well I wouldn’t put it past anyone going through a breakup to do things to bring other people down with them. The more the merrier. That’s the theory here. So it’s highly possible he’s saying I hate you to you, to pull you down with him. He’s thinking I know if I say this I know it’s going to hurt her so I’m going to say it to make her feel exactly how I’m feeling. You know, misery loves company. Ah the good old never talk to me again. Its pretty common thing for an ex boyfriend to say to an ex girlfriend. My first piece of advice is to not get to overly emotional or upset about it. 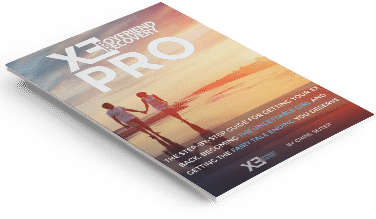 85% of people that come to Ex Boyfriend Recovery and go through a breakup usually get back in touch with their ex at some point in the future. So the odds are in your favor so don’t take it to personally. But with that being said I need to put in a disclaimer here. There are two situations we need to talk about relating to this certain thing. Two Situations? Are they bad? Well one is and one isn’t. First thing you need to look at is If your ex boyfriend said never talk to me again during a heated moment or during the midst of a break up or any kind of highly emotional state. The second situation is if your being flat out annoying. So if your ex boyfriend says this in the heat of the moment he probably doesn’t mean it. On the other hand, it’s bad news if you were being annoying he probably meant it. I’m going to tell you a personal story about me. There was this girl that had a major crush on me and it got to the point where she was texting me a lot and it was getting on my nerves. So one day I tell her please don’t text me this much. This is the type of girl that would text me and if I didn’t respond immediately she would get angry or upset with me. So eventually I decided after this continually happened and I’ve warned her at least three times to tone it down some, I just flat out told her “Hey this is the last time we will be talking, I am going to be blocking you.” I just took the power out of her hands completely. Pretty smart on my part. I though it was pretty low key. You know that was kinda a jerk move. Hey no judging, this is a safe place. Heres the point I’m trying to make if your being annoying towards your ex boyfriend he may mean it when he says that he doesn’t want you to talk to him. Well ok so is there any hope if you’ve been annoying? When your ex says… “oh, lets never talk again” it doesn’t mean forever. Like I said 85% of the people end up getting back in touch with their exes. It’s just if you were annoying to your ex boyfriend there is a higher chance that he meant what he said in the moment. But its not a forever type of thing. It just hinders your chances a bit. Lets move on to the final thing that your wondering about. I don’t know how to say this to you… so I’m just going to say it. I have no problem delivering bad news to you. In fact, I’m not here to be your friend. I am here to help you and sometimes that means telling you things that you don’t want to hear. It’s an excuse. He doesn’t really mean it. It’s never him and it’s always you. Flip it around. It’s you and not him. So what the heck happened? What went wrong in your relationship? Well, in order to explain that I need to teach you something that I like to call the attraction scale. Now the attraction scale is basically an all encompassing scale that I like to use as a number scale. 1 – 10 with one being the lowest rating and 10 being the highest rating. As you can see here this is our attraction scale. So right here close to me is 10. It’s the highest point of the attraction scale. It can’t get any better than this and way over there is 1. Now, 1 is the lowest point of the attraction scale it can’t get any worse than a 1. So let me explain what happened during your relationship that caused him to say it’s not you, it’s me. Basically lets pretend that when you started dating your ex boyfriend you were an 8 on the scale. That’s a pretty darn solid number. But then lets say after three months the honeymoon period fades and instead your a 6 on the scale. Well all of a sudden he starting to look and he’s saying… Hmm… she’s not as good as when I first started dating her. I think I need to find someone else. It’s a little bit of the Grass Is Greener Syndrome where he thinks he can find someone better than you. In an effort not to hurt your feelings and you can kind of understand how he is nice in that way where he doesn’t want to hurt your feelings but I’d rather someone be honest with me instead of BS me. So a lot of women who get this line and understand what happened here get kind of depressed and eat ice cream. But I tend to look at it really differently. I look at it as the ultimate opportunity. What an opportunity you have to move from a 4 to a 10. Imagine if you did that. Imagine if you ran into him one day and you had transformed yourself from a 4 to a 10. Well, he’s going to star thinking maybe the grass wasn’t so green on the other side. Try it… See if you can accomplish it. Do you have a good first text prepared? I don’t see a problem with contactin ghim first after NC. Well what have his actions said? Thats worth breaking no contact for… those things by the way. I am actually making a video on text messaging next and will cover that there. Well, to verify that he means what he says you should try implementing the actions vs. words theory that I talk about in the video. I am so glad I found this website. It is a very good information. What if ex boyfriend said I have no feeling for you. it won’t work. I don’t see future of us. Do you think if I have change to get back my ex if he really mean to this. I am nearing the end of my NC period, and thanks to your advice and suggestions, I’ve really been able to focus. During my NC, I even managed to catch up on most of my school work: thanks to you and your advice! Before I go back into contact, I had a question. What really happened was, my guy friend who had a crush on me asked to go out for coffee sometime, and I answered with a maybe since I didn’t wanna hurt his feelings. However, I worded it slightly wrong, and he thought that I was the one who had asked my guyfriend. I’ve read your articles on how to regain the ex’s trust, and it said cheating was the biggest sin in a relationship. Does the above story count as cheating, and what does my ex really want judging from his reasons of breaking up? And also do you have any suggestions on how to become emotionally close to my ex again when I barely see him at school? He is somewhat similar to you, he does not think that he is able to forgive such betrayal. I would like to show him that I am capable of change, but he says they are all just words and he doesn’t believe me anymore. I have tried telling him to wait and let me prove it to him, swearing off clubs and alcohol, wanting to show him my messages on my phone and letting him know where I am until the trust is gained back, but he said he does not want that and would rather find someone else. Any advice you could give on how I should go about getting him back? I love your videos, I always look forward to them! I hope you keep them up, because they’re so fun to watch and are very informative. I commented on another post a few weeks ago and my question is in reference to this video… what if your ex says “we won’t be getting back together” after 3 months of not being together? Is his mind made up at this point? We were together for 6.5 years and we broke up almost 5 months ago, I’ve been in NC since he said this and I was in NC in the first month of our break up. Break up was totally out of the blue and he hasn’t given me a reason for it. Hope I can get some insight with this! Thank you in advance. I have one more question, sorry to keep asking! So I completed my 30 day no contact successfully, reached out asking how things were going with a new startup company he was working on right when we broke up, and got (what I think) is a positive response. He said “Hey Al, everything is good. I hope you’re doing well too.” (Al is my nickname, so that was sweet of him). My question is, I have furniture at his place, and keys to his house, and he hasn’t asked for the key back or mentioned getting the furniture at all…these are all good signs, right? That perhaps he still doesn’t know what he wants? When he broke up with me he said “he was sure this was his final decision” but somehow I don’t believe that. Do you have any examples of texts that are engaging? You have a good chance in my opinion!